The Nook Tablet will look almost identical to the Nook Color, but with better specs. On Monday, November 7, Barnes & Noble is expected to launch a Nook tablet, which would go head-to-head with Amazon’s upcoming Kindle Fire (available November 15). The Nook Tablet was leaked via marketing materials that detail it would cost $50 more than the $200 Kindle Fire, but would also double up on storage and RAM compared to Amazon’s much anticipated tablet. The Nook Tablet looks very similar to the Nook Color Android reader. The leaked marketing sheets from Engadget and SlashGear show the same 7-inch touchscreen display (with 1024 by 600 pixels resolution) found on the Nook Color, in a slightly thinner (0.5-inch versus 0.48 on the tablet) and lighter (14.1 ounces versus 15.8 ounces) casing. Inside is where the biggest changes to the Nook tablet will be found. The specs list a dual-core 1.2GHz processor with 1GB of RAM, which would allow the Nook tablet to run apps faster, as well as play HD video content from Netflix or Hulu Plus. 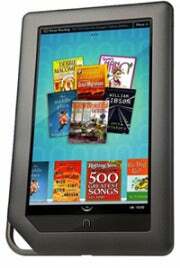 The Nook tablet also promises around 8 hours of battery life, or 4 hours of watching videos. Just like its Color sibling and the Kindle Fire, the Nook tablet would run on a heavily customized version of Android. Is The Nook Tablet Better Than the Amazon Fire? So why would you pay $50 more for the Nook tablet, instead of a $200 Kindle Fire? The marketing materials point out that Barnes & Noble will flaunt the fact the Nook tablet has double the amount of RAM of the Kindle Fire (1GB versus 512MB), double the amount of bundled storage (16GB compared to 8GB), as well expandable storage up to 32GB (the Fire does not have an SD card slot). Just like the Kindle Fire, the Nook tablet would be a media consumption gadget, with considerably fewer features than Apple’s iPad, hence the much smaller price tag. But we have yet to see how either the Nook tablet or Kindle Fire will perform in tests. On paper, the slightly faster processor and more RAM on the Nook seem to offer a reasonable bump in storage and worth an extra $50.